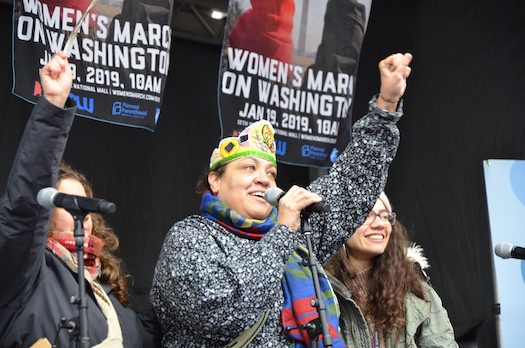 WASHINGTON—The 2019 Women’s March was smaller than the previous two but had tens of thousands of participants in the District who were just as energetic, vocal and committed as marchers in 2017 and 2018, participants said. Women gathered and marched in Washington, D.C., New York City and other parts of New York, Denver, Chicago, Seattle and all points in between. 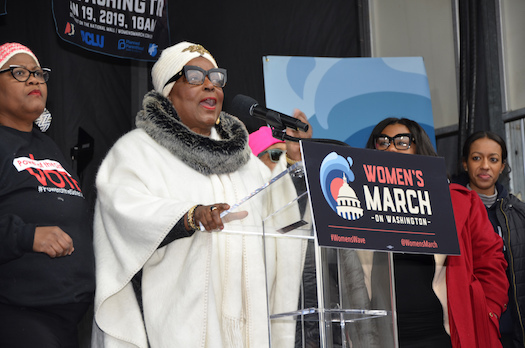 The march began two years ago when on the day after the inauguration of President Donald Trump, several million women, men and children made it the largest single-day demonstration in U.S. history, led by women and women of color in particular. Then, as now, women and their allies in the U.S. and other parts of the world, marched to express their vehement hostility towards Mr. Trump, opposition to his hardline rightwing agenda and support for women’s social, civil and human rights. Participants who gathered at Freedom Plaza said they felt they had to support the march, and some like Fatima Toor, said her desire to attend was heightened after learning just before the march about the controversies that have dominated “mainstream” media coverage. Ms. Toor, is a Muslim from Pakistan who works for the District of Columbia Public Schools. She said she arranged with “a bunch of Muslim girls” to go to the march. The ramped-up attacks against the leadership of the Women’s March, especially on Tamika Mallory by Whites and Jews who demanded she disavow and condemn Min. Louis Farrakhan, was right out of the playbook of White supremacy and was part of an effort to hijack the march. 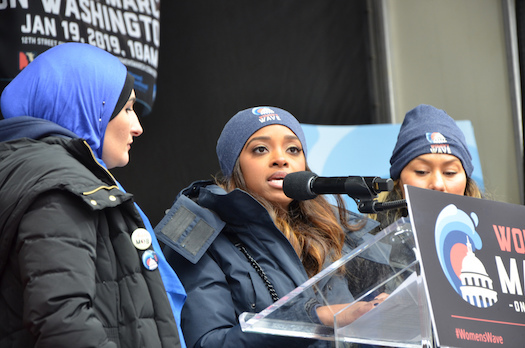 Tamika Mallory (center) with Linda Sarsour, (left) and Carmen Perez. The other major march leaders were Linda Sarsour, a Palestinian woman, Carmen Perez, a Latina, and Bob Bland, a White woman. In an interview with journalist Roland S. Martin, Ms. Mallory called much of the “controversy” manufactured as part of an effort by women who were asked to step down from leadership roles years ago. It was a power struggle to control the march, then they tried to derail it by spreading false stories of anti-Semitism, she added. A diverse collection of musical groups regaled the crowd with songs of resistance and women’s empowerment, and an equally diverse group of women—Black, Latina, gay, bisexual, trans, disabled and other women spoke. 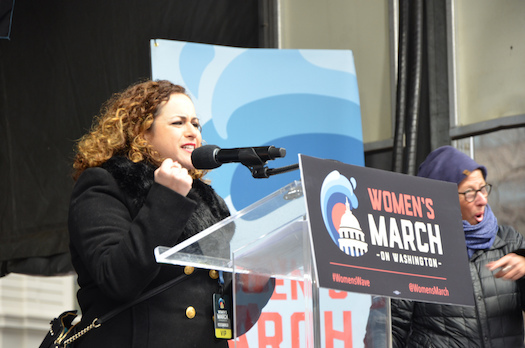 Ms. Sarsour, a March co-chair and board member, said on Twitter days before the march that she and others at the 2017 Women’s March made a declaration to win back the House. In what is generally regarded as a pointed rebuke of Mr. Trump and the Republican Party’s stewardship of the United States over the past two years, the Democratic Party was swept into power in the House of Representatives. The shift in Republican fortunes was fueled by a Black woman-led suburban revolt with voters supporting progressive candidates and political outsiders, sending 127 women—the most racially diverse group of people ever—to Congress. The 116th Congress boasts the first two Muslim women, Ilhan Omar and Rashida Tlaib; the first two Native Americans, Deb Haaland and Sharice Davids; the youngest member, Alexandria OcasioCortez; and the youngest Black woman, Lauren Underwood, among other firsts. This includes ramping up voter registration, having conversations, building platforms and creating excitement and momentum, she added. “We are putting out a policy agenda because there are tangible policies that can alleviate suffering, stop the bleeding just a little bit,” she continued on Twitter. “It was written by 50 women experts around the country and it’s broken down into 10 areas, including civil rights, civil liberties, reproductive rights, environmental justice, and healthcare so that all communities are able to be seen. It’s not an aspirational platform. There are specific things that Congress could pass right now. 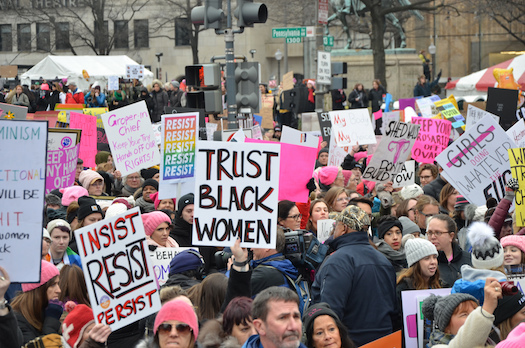 Even if corporate media and some Jewish publications have glommed onto accusations of anti-Semitism, and stories bounce around describing tensions between board members, disgruntled movement activists who’ve been deeply critical of the march leaders and other issues, what several women said is real, is a divide between Black and White women. Much of the rift is rooted in history and the unresolved wounds of racism and discrimination; the culpability of White women in the subjugation and oppression of Black women in the past; and most recently, dismay in Black circles at the number of White women who voted for and support Mr. Trump. Ms. Ladner, who was a key organizer of the Freedom Summer Project, said there has always been conflict and tension between Blacks and Whites. The fact that the march has “been dominated by Caucasians” comes with its own set of problems and furthermore she added, whenever Black people are involved or focused on building their communities certain Whites sow discord. White women expressed their opposition to Trump administration policies and sexism. Roxanne Gupta and Medea Benjamin are two White women who consider themselves allies of Black people and who have been involved in movement work for many years. Both acknowledged the difficulties and tensions, said they were pleased with the turnout of White women at this year’s march and spoke of the need for continued engagement. Ms. Gupta, an anthropologist and activist, said she wasn’t even aware of the infighting until her brother sent her a news article. She said the dominant mindset in this country is racist, as evidenced by what continues to unfold in the Trump presidency. March organizers said diverse voices and a practical political agenda are important for its success. 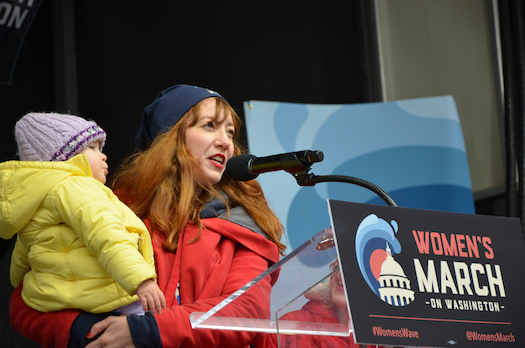 Ms. Benjamin, co-founder of CODEPINK: Women For Peace, a peace and social justice organization, said this year’s march was “certainly a lot smaller,” but was positive, upbeat with good energy and had racial and generational diversity.